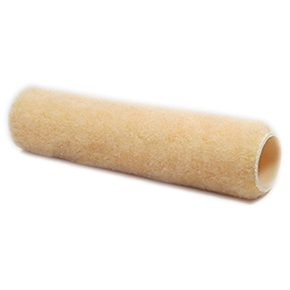 PRODUCT: Paint Roller Cover, 9-inch, 1/4 nap, 1-1/2 ID, Solvent Resistant Polyester NPa and Core. For use wiht all types of coatings including solvent based coatings, epoxies, and urethanes. Price/Each. APPLICATIONS: FOR USE IN ALL TYPES OF COATINGS INCLUDING SOLVENT BASED COATINGS, EPOXIES AND URETHANES. CONSTRUCTION: Designed for use in high solvent-based coatings such as epoxies, urethanes and fiberglass resins in both industrial and marine applications. The core is extra thick, heavy-duty, and multi-ply and includes a specially formulated adhesives which adhere the polyester nap. The roller cover is suitable to all paints types and provides even pick-up and release of materials. Actual color may vary from photo.